I found Z: A Novel compelling to read. I am ashamed to admit I did not know much about Scott F. Fitzgerald, let alone his wife, Zelda, so I found this book interesting on many levels. Of particular interest to me were the personal struggles and challenges both Zelda and Scott experienced individually and how these impacted their marriage as well as the history and their life of grandeur. There are many of these types of novels out there now. ‘The Paris Wife and ‘The Aviator’s Wife’ come immediately to mind, and I think they provide an interesting viewpoint on the these infamous men, as well as their wives, giving us a glimpse of their lives behind closed doors – from the wife’s perspective. I haven’t read either of the above (okay, I got a quarter of the way through The Aviator’s Wife before my netgalley copy archived, but I enjoyed it until then), but I may seek them out as I find this type of read more than entertaining, I find it educational. A writers lifestyle in the roaring twenties (an era I love) was eye opening. That they lived like celebrities do today fascinated me. I thought this was written so well, I felt I was right alongside the Fitzgeralds as they drank and danced and were merry. It was delightful to see the excitement of their new relationship juxtaposed alongside this exuberant time, making it all seem even more grand. I was really surprised at the depiction of both Scott F. Fitzgerald and his ‘friend,’ Hemingway. I had no idea they could each be so nasty, both to the women in their lives, and each other. But, I didn’t know much about them other than a few of their novels in the first place so I don't kno wwhy I was so surprised. Zelda’s and Scott’s relationship could probably mirror many tumultuous relationships today. The two seemed to fuel each other’s fire and encouraged and discouraged in all the wrong places. One wonders whether they would have ended up where they did if they had married other people. Zelda’s struggles, including living with her husband’s alcoholism, their depleting bank account, and what would now be called bi-polar disorder, are portrayed well. Also poignant is her struggle to maintain her own identity. She wrote her own pieces of fiction, but found it difficult to be taken seriously in Fitzgerald’s shadow and as a wife and mother. I think Zelda’s struggle for self is one that women can still identify with and relate to, regardless of the famous writer husband and lavish lifestyle. I think what I liked most about this type of novel is that it bursts open other viewpoints. After I finished this book, I did some google research and discovered that Zelda was considered a crazy alcoholic, and portrayed with ruining her husband’s career. One reads Z: A Novel and realizes that maybe there is a different perspective to the story. Maybe it was the other way around. It makes you realize that if one takes all perspectives into account, you may come to some sort of truth, or at least the potential that one viewpoint does not tell the entire story. 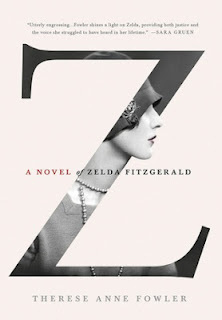 All in all, I think fans of the era, and Fitzgerald will enjoy Z: a novel, as will anyone looking for a different perspective, or someone, like myself, who was barely informed in the first place.